Today, Gonzalez is president and CEO of City National Bank of Florida, a 65-year-old financial institution with more than $4.4 billion in assets. The bank has also been awarded the highest five-star “superior” rating from BauerFinancial for its outstanding financial performance and was named the Best Business Bank by the Daily Business Review. It’s everybody’s responsibility to give back. Diversification, discipline, and preparation. I think recessions are inevitable and it’s just a matter of how well prepared you are to deal with recessionary periods of time. For me, unfortunately, or fortunately depending on how you want to look at it, success is a never-ending goal and is primarily measured by your clients, employees, and your peers. Hard working. Latinos are a very important part of this country’s future. Gonzalez believes that one of the keys to a successful institution is diversification. “Diversification is important in any business,” Gonzalez says. “I believe if it’s done correctly it reduces overall risk.” Thus, City National Bank invests in offering a wide range of services including personal banking and banking for private clients, small business banking, and corporate banking for larger enterprises, as well as real estate banking. Gonzalez acknowledges there are some factors he and other banking executives simply cannot control such as inflation, political instability, and interest rates. “But, I think it’s our job to try to mitigate the things that are somewhat controllable, particularly in today’s rapidly changing world,” says Gonzalez, who has a degree in finance and international business from FIU and is a graduate of the Kenan-Flagler Business School executive leadership training program at the University of North Carolina. 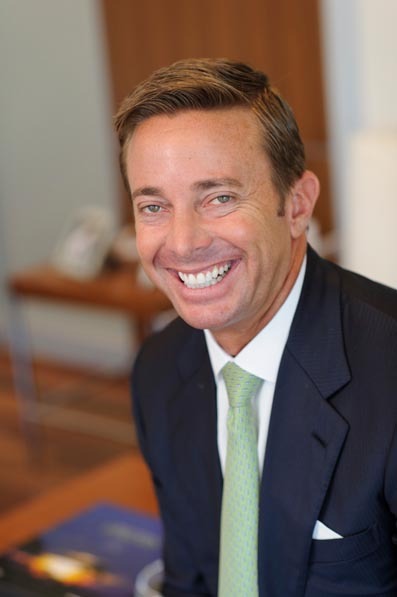 For two decades, Gonzalez worked with Wachovia, where he served in various leadership and management roles, including regional president of Wachovia for Southeast Florida. During his time with Wachovia, Gonzalez says he learned that banking is less about numbers and more about people. After all, it was working with people that made him fall in love with the industry in the first place. In 2011, City National Bank received the first Community Bank of the Year Award from the South Florida Business Journal, which recognized the bank’s contributions to the local economy. This year, the newspaper honored City National Bank with its Outstanding Community Service Award. A Miami native with Cuban heritage, Gonzalez extends his work to help others beyond the walls of his banks. “At City National Bank we believe as a community bank it’s our responsibility to give back to the markets that we serve and the markets that allow us to be successful,” he says. Gonzalez says more than 75 City National Bank employees are involved in local service organizations, such as the United Way, March of Dimes, Make-a-Wish Foundation, and Big Brothers Big Sisters of America. Gonzalez serves on the executive committee for the United Way and the board of directors for the FIU Foundation and the Museum of Contemporary Art. Juggling a demanding career with community service is tough, especially since Gonzalez is also a family man with a wife and seven-year-old twins. “It’s all about discipline, trying to organize your time as best as possible, and trying to be a little balanced,” says Gonzalez, who was named a finalist for CEO of the Year for the last two years by the South Florida Business Journal. “The balance part I’m still working on. My wife will confirm that,” he adds with a laugh.